A student of Afro Sensei, Toda torments her teacher by both making fun of him and involving him in BL fanart on whiteboards and other classroom items. She also adapts all of her projects to be otaku-oriented, such as turning a still life into a painting of Char Aznable. Her fujoshi habits are pervasive, much to the chagrin of Afro Sensei. Kankiri is a university student who tries her hardest to hide her identity as a female otaku. However, it turns out to be futile as almost everyone she meets either is an otaku themselves or is familiar enough with otaku and fujoshi to recognize the signs of one. She first got into BL because of the anime Mashin Eiyuuden Wataru. Prior to that, she started becoming an otaku in elementary school, and by middle school discovered that she has a thing for age gaps. Kankiri is also critical of impossible shirts on women in anime and manga, comparing them to pants that cling to a man’s erection at all times. 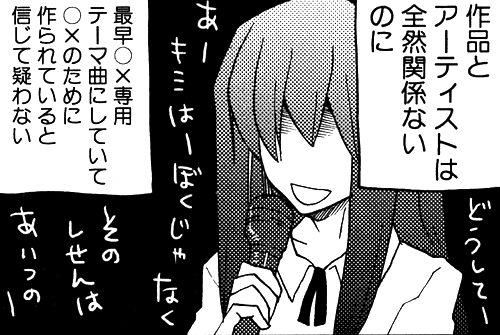 Kankiri believes couplings and reverse couplings are fine, which puts her at odds with other fujoshi. This fujoshi participates in a futsal game with other anime fans, some of which are cosplayers. Nothing else is known (because the artist actually forgot to make a manga about fujoshi despite the book being a fujoshi character anthology). 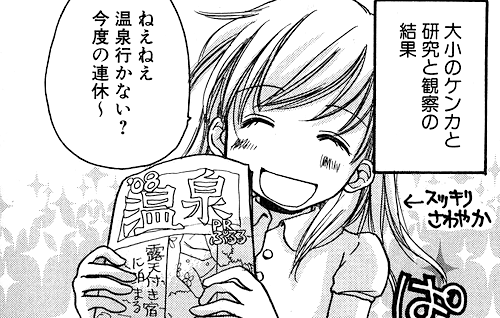 Other than that she is a fujoshi, there is no other information. This un-named fujoshi joins her friends at a karaoke joint after a doujin event. She participates in the singing of anime themes and is into the pairing of Randy x Gerdt. When looking in music stores, she actively searches for “Randy x Gerdt-esque” songs.